The Manor hotel in Kashipur is one of the best hotels situated in the plains of Uttarakhand state. The Manor of Leisure Hotels lures guests with its enchanting ambience, old world charm and personalized service. All guest rooms have inspiring views of the courtyard and the well manicured landscaped gardens. All the rooms of the hotel are air conditioned, spacious and well equipped with modern amenities. The resort offers 34 guest rooms categorized under Superior, Deluxe and Family suites and is located just 2 kms from the nearest railhead. The Manor is spread over 1.5 acres of land on the outskirts of Kashipur (Uttaranchal) on NH 74. 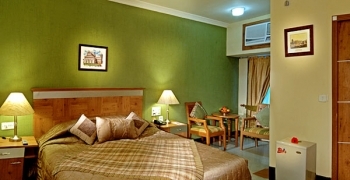 The hotel is located 220 kms from Delhi and just 1.5 kms from Railway Station. 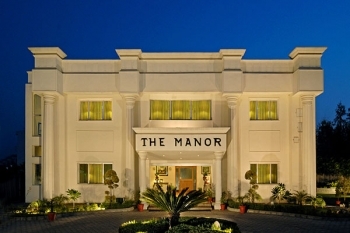 The Manor in Kashipur serves 45 stately rooms and suites and all of them are air conditioned. The rooms are divided into 36 Deluxe Rooms, 3 Superior Rooms and 6 Suites. Room amenities include air-conditioner, cable television, telephone, and attached bathroom with 24 hour hot and cold running water. All the rooms face the courtyard or the landscaped gardens. The Manor Hotel houses an excellent bar named as 43covers and lounge called Big Ben. The bar gives us an elegant touch of British atmosphere. The hotel also has an open air garden Grill House. Dining at The Manor is a completely delightful experience. The Grill House serves the tastiest kebabs in town. Not only delicious food but the ambience of the restaurant has also played a great role in the popularity of the hotel. There are a lot of activities in the luxury hotel Manor which the guests can keep themselves busy. Indoor games available at Manor are Kite Flying, Carom, Badminton, Ludo, Chess, Playing Cards. Guests can also enjoy games like Pool Table, Table Tennis. And for the fitness freaks Fitness Centre and Swimming Pool plays an important role. You can also travel to the beautiful Nainital and wild Corbett National Park. The nearest airport to Manor Hotel in Kashipur is Pantnagar located 60 kms away. The bus stand is only 1.5 km away and the railway station is 2 km away from the Manor. Popular places like Corbett National Park and Nainital are 30 and 80 km away respectively.